‘First of all, let us thank everyone who has made this occasion possible. More than that, let us thank everyone who has made this environment possible. Being a Buddhist myself, I think of the blessing of Buddhas and Bodhisattvas, and the blessings of our lineage, as the main cause behind this positive environment. And together with this cause, we – each and every one of us – have also played a part in terms of our aspirations and prayers. Due to this combination, we have this wonderful environment. Over the years, you will see more and more of what is the true aim and intention of this place. As has already been mentioned, the aim of course is to further strengthen the activity of the Buddha dharma, meaning the practice of Buddhism in modern terms – and particularly the monastic sangha. This is the main aim. What we are trying to emphasize here is that, through this simple education center, we will be able to somehow strengthen the monastic sangha. In many ways it might seem like a novelty, it might seem like a fiction. But it is possible. I must admit that it is a bit of an experiment, it is a bit of a fantastic idea, simply because from the birth of Buddhism, which was over 2500 years ago, until now, the Buddha dharma has survived through none other than the quality of the monastic sangha. And that tradition, that system has continued over the course of time until now in a very traditional manner. Suddenly, to come up with this idea – that we could actually help the monastic sangha through a mere school – sounds extremely fantastic. So therefore, the result is something we will have to see, ‘result’ not as something solid, ‘result’ in terms of whether what we will try to do here could help lengthen the life of the monastic sangha. That’s the aim. I very much appreciate everyone being here and giving us your attention, and your keen interest in supporting this project in every way. For that you have my full gratitude, gratitude in terms of offering my prayers, my deepest aspirations, so that the support that you have given here is not wasted, that the support that is given here will bear wonderful fruit. This, of course, is none other than the development of a proper monastic sangha. The monk body that we have here is the result of a lot of hard work of the past generations, of great beings, great masters, and great devotees of the Buddha dharma. And in a way, if you really look at this monk body that we have here, as well as around the world, it is possible that in time, this body might become more and more reduced, and therefore even the Buddha dharma itself might become more and more of a ‘fantastic idea’ as I said earlier. So therefore, if we have a lack of understanding of the benefit of having a monastic sangha, we must take the time to learn it. It doesn’t mean that we suddenly have to wear a robe and shave our heads, but at least we can take the time to reflect and come to terms with what it means to become ordained. If we do that, I think there is great virtue and I would like to ask everyone to reflect on this. If you have an understanding, then try to offer this kind of environment, offer your support, offer the encouragement that everyone needs. Particularly to the youth, because the future generations of the monastic sangha will highly depend on none other than the youth. 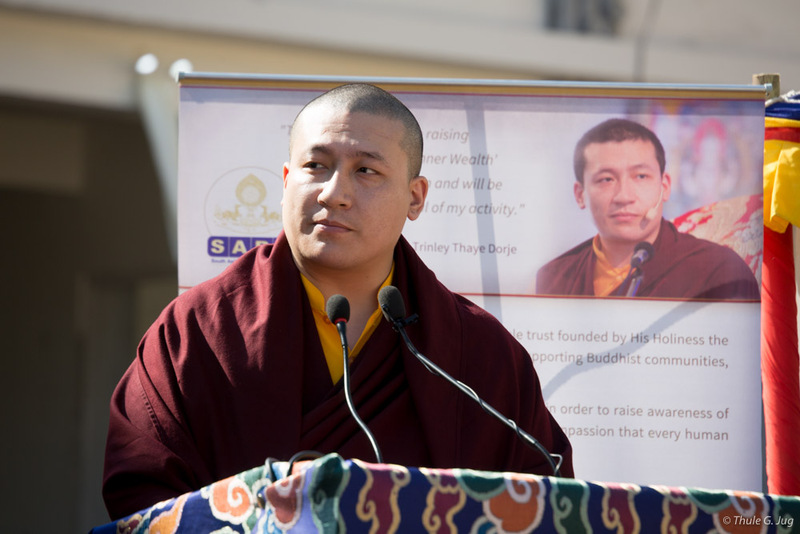 Particularly in our Himalayan regions, we are very much connected with the Buddha dharma, with its history, and so we actually know its value. Of course, as I said earlier, sometimes due to a number of reasons, we might be lacking in certain types of knowledge, but most of us know the history, we know the value of having a monastic sangha in our lives. Therefore, please take some time to reflect on all this, and encourage the youth, if you see them express an interest, if you see sparks in them that they wish to explore more, that they wish to see what it means to have the luxury of time to reflect on the practice of compassion and wisdom. And if we do this, then not only will we experience happiness and peace right now in this life, but in many ways we help secure the happiness of future generations as well.